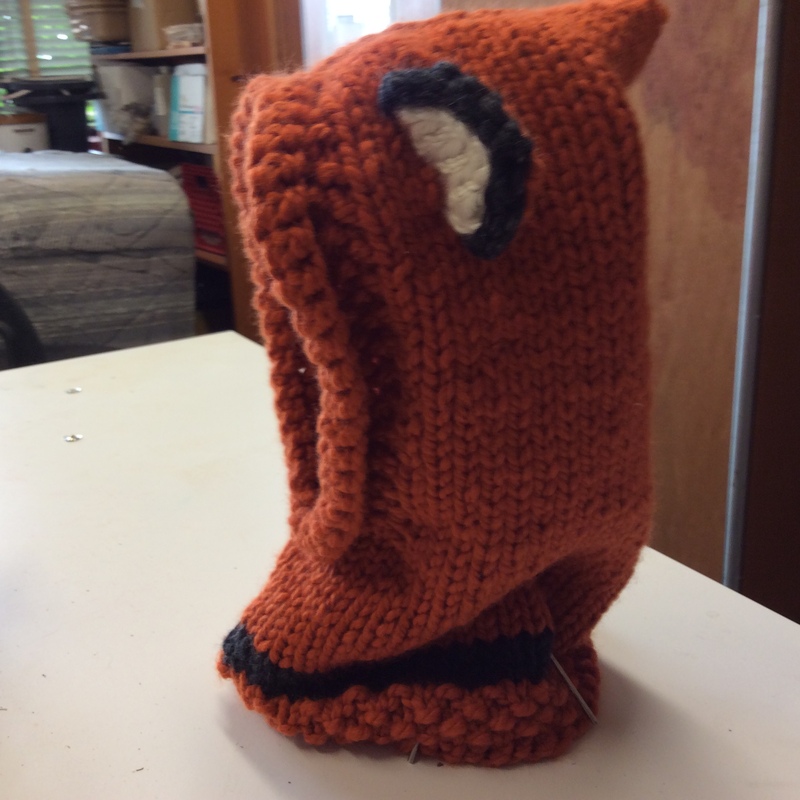 Catherine is learning she doesn’t enjoy finishing (she already kinda knew that) but she did it anyway for the Failynn Fox Cowl by Velvet Acorn out of Lion Brand Thick and Quick Pumpkin. She also did some improvisation with the Chain Mail Slippers that she was doing for a Arcata Plays in the Park production locally. 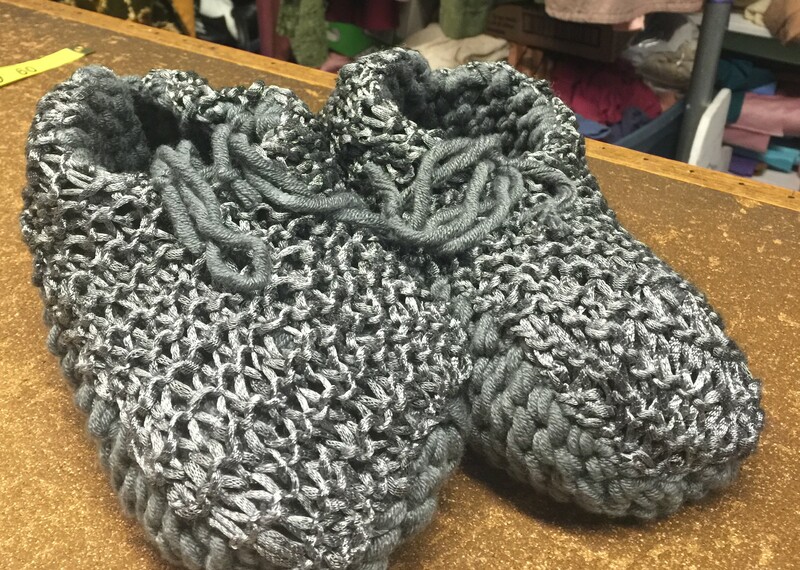 She used the Simple Man Slipper by Melissa Mall in Wool-like Chunky by Loops and Threads. Margaret learned how to work an applied edge in crochet (adding the edging perpendicularly to the bottom of the shawl. — oops, she added it to the wrong edge. 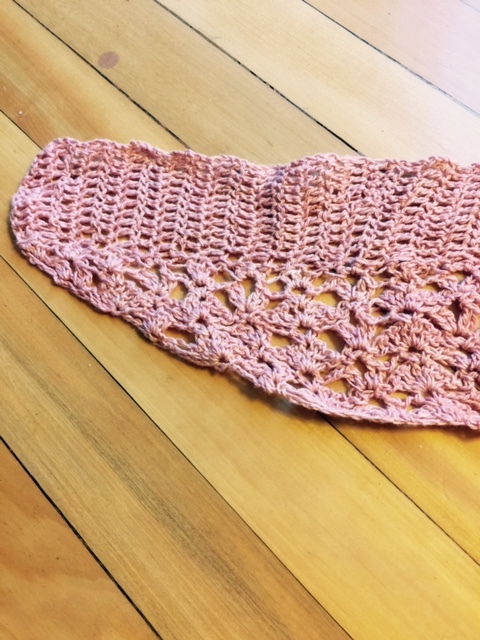 The pattern was Terra Cotta Shawl from More Love of Crochet in Summer of 2014 and now called Thorns by Rebecca Velasquez. It is now sold on Rebecca’s website. 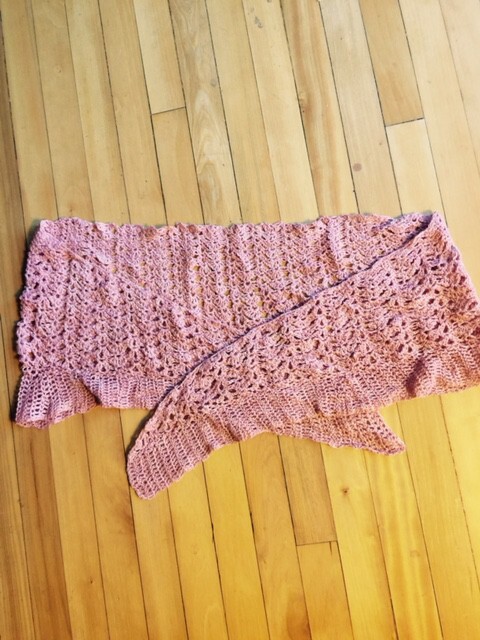 Margaret also used lace weight yarn for an entire project for the first time — a lovely silk/linen blend by Sincere Sheep. 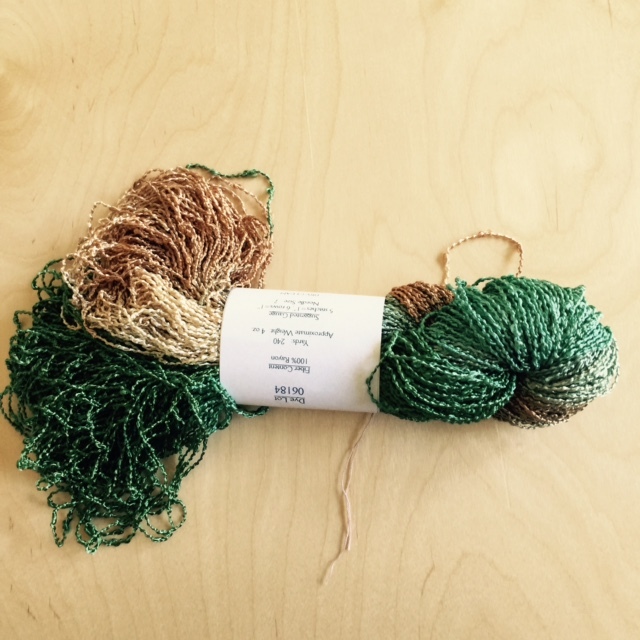 Catherine talks about seeing color — in knitting and crochet. Among other things, she mentions the Concetta Antico who is documented as seeing colors differently. 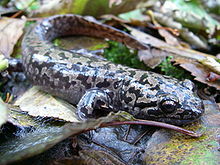 Here are some links to her research. Catherine thinks these guys are cute although they’ll probably bite you. For a real cushy sock, try the princess (as in the princess and the pea) sole. Melissa Mall included them in her pattern above. Knitty’s Cinderella sock pattern by Kathryn Beckerdite also includes instructions for the princess sole. 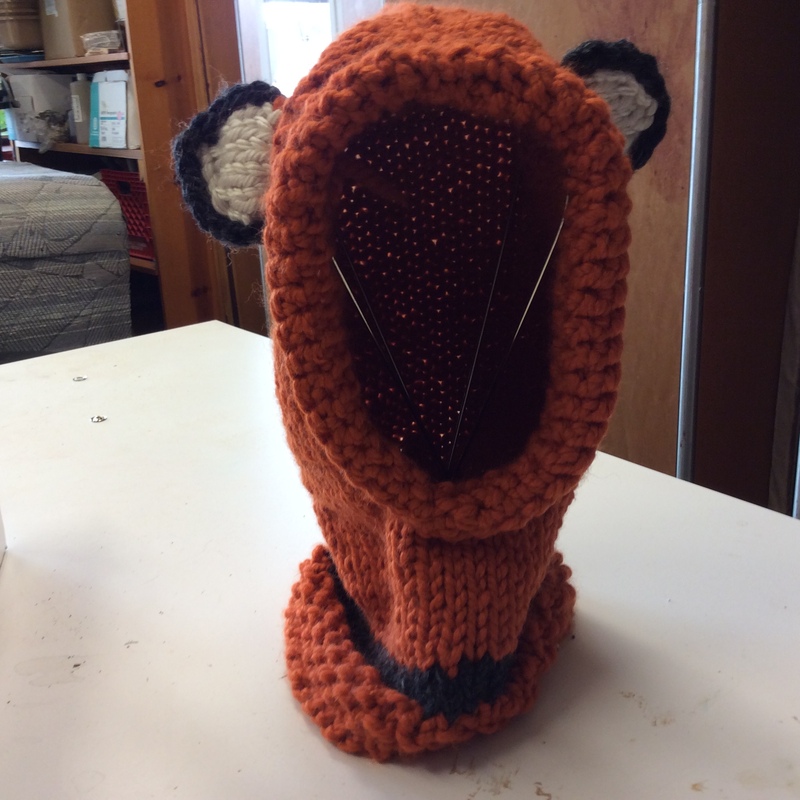 We’re still offering the incentive prize for the next group of 100 members in our Teaching Your Brain to Knit Ravelry Group. I hadn’t heard of the book. Thanks for letting me know. I’ll check it out.